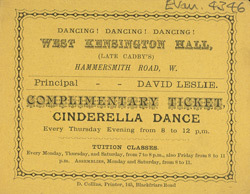 This is a ticket for the Cinderella Dance, held every Thursday evening at West Kensington Hall. Balls and dances were important social events in the Victorian era, especially for the upper and middle classes who had time to prepare and to learn the necessary dance steps. Groups dances like the quadrille were very popular as were the gallop and the waltz. Etiquette was very important when dancing and there were numerous rules with which each dancer had to comply. The lady had to be asked to dance in the correct way; the participants had to know how to hold 'appropriate' conversations; and, most importantly, they had to dress in the latest ballroom fashions.